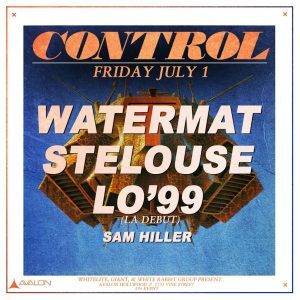 Watermat – Dance music has never been the same since the rise of French artist Watermät. Coming up as an underdog, although not a complete newbie, he’s by now turned the scene upside down with his completely original sound. French DJ/Producer Laurent Arriau has been composing tracks for several artists in the past, before releasing his own tracks. In the autumn of 2013 he decided it was his time to take the stage himself and share his love for dance music with the world. His first self released EP “Sparks”, including the tracks ‘Sparks’ and ‘Something About You’, was released in December 2013. After that, the buzz around Watermät started rolling and Spinnin’ Records took their chance to sign him for his next track ‘Bullit’ on their Deep imprint in February 2014. Stelouse – StéLouse (pronounced “stay loose”) is the new electronic project from budding producer Ross Ryan. Beginning his love affair with music a very young and age, Ross performed in various rock bands after high school, some of which went on to see moderate local and national success. In the spring of 2011, Ross became very intrigued by the world of electronic music production and the seemingly endless sonic possibilities it has to offer. Over the past three years, and a few aliases later, the skills were honed in enough for Ryan to embark on his greatest musical venture yet. Combining influences of hip hop, RnB, 80s new wave, and of course the dance club banger, StéLouse was born in August of 2013. Along with the idea of not just presenting the project as only a “DJ” gig but also as a full live performing band. StéLouse’s debut EP, Home, is set to see release in March of 2014 along with live shows and a handful of singles to follow. Welcome to the new world.